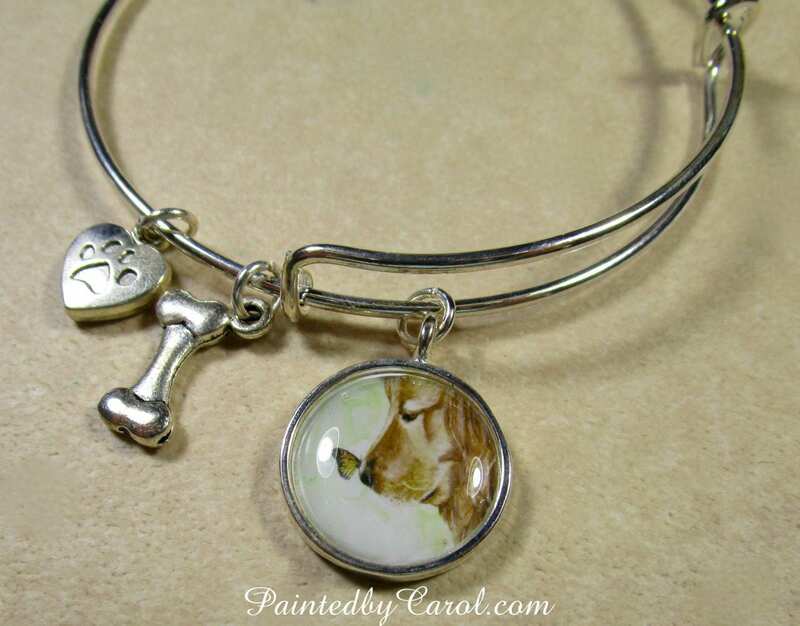 This golden retriever bangle bracelet features my watercolor painting depicting a dog with a monarch butterfly on her nose. The expandable bangle bracelet is silver-plated brass and will fit wrists from 7 to 9 inches. The golden retriever charm features a 16mm cabochon of my painting. The silver-tone metal heart paw and dog bone charms are nickel-free zinc alloy. Mailed across the state as a gift. Recipient was very pleased. Thank you! I purchased the bracelet as a gift for my teenage niece who has a Golden Retriever. Exactly as described, perfect gift, excellent personal touch to packaging and fast shipping! I’m very happy with this purchase.